Affordable transcription services are a huge benefit to businesses and individuals alike. Have a series of interviews or focus groups coming up? Need to transfer your ideas and to-dos from your head to your computer? Being able to tap into a productivity-boosting transcription solution that can help to finish projects and tasks at hand in an efficient, cost-effective way goes a long way. Transcribing recorded audio and video files into highly accurate text is one of the best, hands-off methods for getting a lot of things done, whether they be for professional uses like transcribing meetings and conferences, or even just putting together a meal plan with a grocery list. No matter your requirements, there are affordable transcription services that can help you save a lot of time, expended energy and, of course, valuable money. Starts at just $0.79 per audio minute for transcripts. Offers fast turnaround times (typically 2-3 business days, and often within 24 hours). Features 90-95% voice-to-text accuracy, based on audio quality received. Is perfect for everyone from students to busy professionals and parents! Our Pricing Calculator will help you figure out exactly how much your First Draft transcription order will cost – plus, it’s easy to compare the difference in savings from one transcription service to another, like our Standard or Verbatim transcription. Just enter in some of your order and file details, apply the settings, and get an automatic quote. Have audio and video files laying around that are waiting for the royal transcription treatment? We made it easy to sign up for a free account, upload files, and have them transcribed and delivered quickly – without breaking the bank. Alternatively, you can always contact our team directly if you like working on things one-on-one (we’re here for you!). 1. On the Customer Portal homepage, you’ll see the area where you can upload audio and video files. We allow you to upload from your computer, Dropbox, or media-hosting sites like YouTube. Upload your file from your preferred source, or drag-and-drop it into the highlighted area. 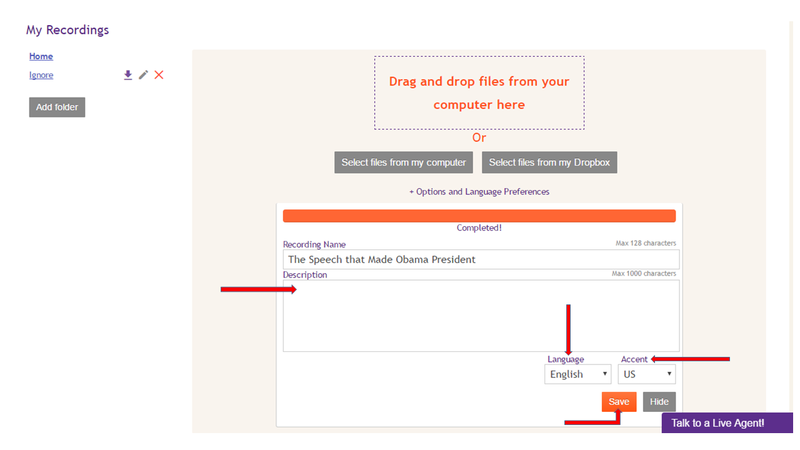 You can also organize your content into folders, and download completed transcripts in the formats available to you. 2. As the file is uploaded, you can see the orange bar marking the upload progress on the screen. During the upload time, you can change any specific details for the recording — name, description, source language, and even accent. Important! Be sure to select the right language and accent for your file to ensure that your transcript is processed exactly the way you want. 3. 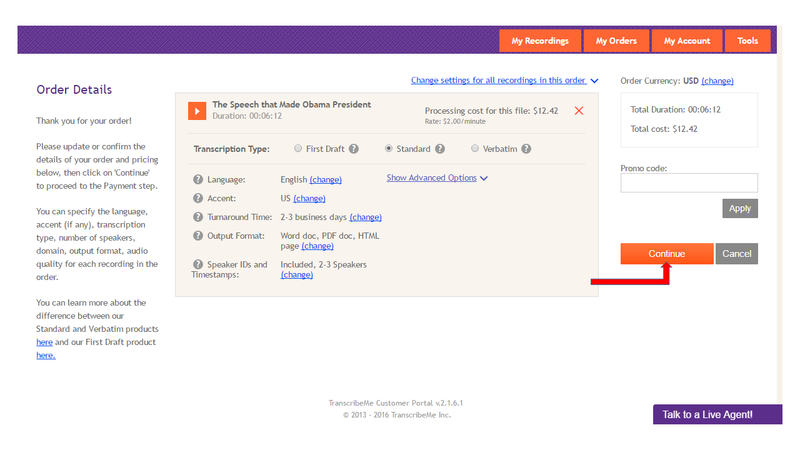 After the file is uploaded, start your order by clicking the Transcribe button to the right of the file name. This will open up the Order Details page, where you will see the total price of your order and change details for any of your files prior to submitting the order. 4. On the next screen, you’ll be prompted to enter your payment information into our secure system. After you click Continue you will have the opportunity to verify your payment details on the Order Confirmation page. If everything looks right, click Pay and Confirm. Once the transcript is completed, you can download it the format you’ve have ordered! Have any more questions about our affordable transcription service? Please reach out to us anytime. This article was originally published on December 1, 2016.